From the Director of The Nightmare Before Christmas comes a visually stunning stop-motion animated feature! Coraline Jones is bored in her new home until she finds a secret door that leads her into a world that's just like her own...but better! But when this fantastical adventure turns dangerous and her "other" Mother tries to keep her forever, Coraline must count on her resourcefulness and bravery to get home. 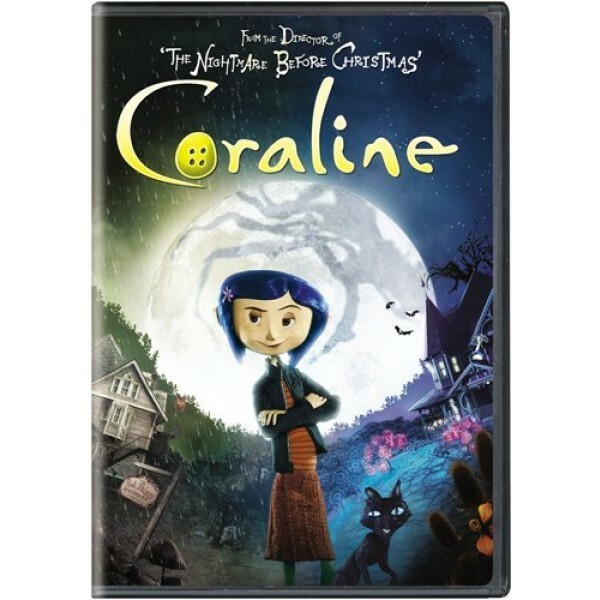 Based on the modern classic Coraline by Neil Gaiman, critics are hailing Coraline as "a remarkable feat of the imagination." For Coraline-related books and items, visit our Coraline Collection. 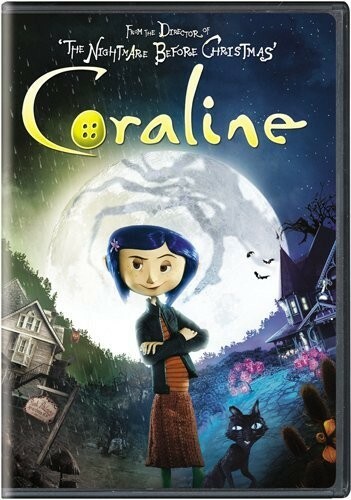 A dark and creepy film about family relationships directed by Henry Selick of Nightmare Before Christmas and James and the Giant Peach fame, Coraline is based on the haunting book Coraline by Neil Gaiman. The first stop-motion feature shot in stereoscopic 3-D, Coraline features big-headed, stick-bodied animated characters with huge eyes and demonic grins set against menacing backgrounds and an undercurrent of spooky music. Coraline is a teenager who has just moved to an old house in the middle of nowhere with her writer parents and she is bored, bored, bored. Her only companions are an annoyingly talkative boy Wybie (short for Why Born), some eccentric neighbors from the theater and circus, and a strange, button-eyed doll with a marked resemblance to Coraline which Wybie found in an old trunk of his grandmother's. When Coraline finds an old door hidden behind an armoire and papered over with wallpaper, she convinces her mother to unlock it, only to find a wall of bricks. When Coraline revisits the door later that night, the bricks magically disappear and she discovers a strange pathway to another world where everything is just what she wishes for. In stark contrast to the real world where Coraline's parents just don't have time for her, her "Other Mother" and "Other Father" in this alternate world are the perfect loving, attentive parents who anticipate her every need and desire. Initially comforted and quite happy in this new world, suspicion that things may not be quite as they seem grows inside Coraline and her disquiet is furthered by the mute "Other Wybie" and a strange-talking cat that seems to move between both worlds.